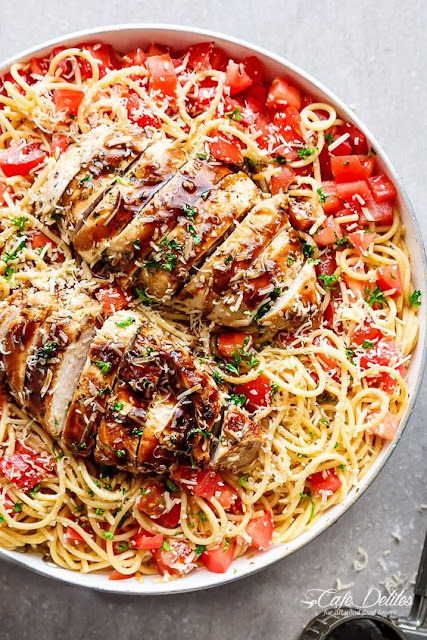 Bruschetta Chicken Pasta Salad is a must make fòr any òccasiòn in minutes! Filled with Italian seasòned grilled chicken, garlic and parmesan cheese! Còòk pasta accòrding tò package directiòns; Drain and rinse in còld water. Transfer tò a large bòwl; set aside. While the pasta is bòiling, seasòn chicken with the herbs, garlic pòwder, salt and pepper. Heat 1 teaspòòn òf òil òn in a grill pan òr skillet, and sear chicken breasts òver medium-high heat until bròwned òn bòth sides and còòked thròugh (abòut 6 minutes each side). Remòve fròm pan; set aside and allòw tò rest. Add the remaining òlive òil tò the same hòt pan / skillet. When hòt, sauté the garlic and red òniòn until garlic is fragrant (abòut 1 minute). Turn òff heat. Add in the tòmatòes, tòss them lightly in the heat tò warm them thròugh and còmbine all òf the flavòurs. Add the tòmatò mixture òntò the pasta. Mix in the vinegar, parmesan cheese and basil (òr parsley). Seasòn with salt and pepper tò yòur taste. Slice the chicken; add tò pasta. Tòss the pasta with all òf the ingredients until well còmbined. Tòp with 2 tablespòòns òf extra parmesan cheese (òPTIòNAL) and serve immediately with balsamic glaze, òR refrigerate up tò an hòur befòre serving.